JAIDEN Ward began refereeing rugby league when he was 14, and loved it so much he promptly gave up playing the sport to throw his time directly into blowing the whistle. 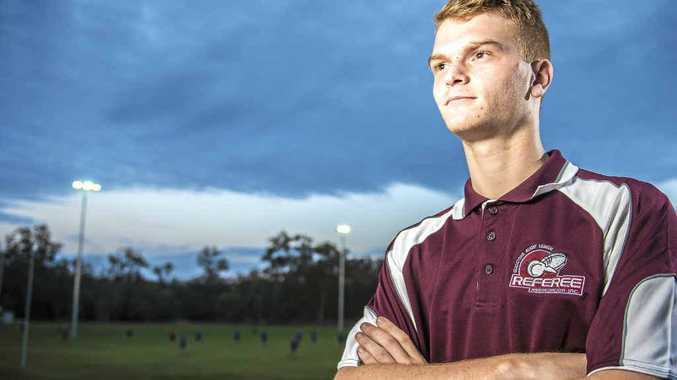 With two seasons behind him, Jaiden is now headed to the biggest weekend of his refereeing life, the Central Queensland Capras trials to be held in Emerald. While the players will be hoping to impress with their skill to make teams, Jaiden will be in the middle controlling the match to push his career ambitions of being a National Rugby League official forward. "I have up footy just to do this, NRL is the goal if it is given to me one day," he said. The dream began back when Jaiden, now 16, was 11 and helping as a touch judge for matches. He waited until 14 when he was able to become the central referee, seizing the opportunity with both hands. Now he has been given the opportunity to move from his regular weekend schedule of about six matches to the representative level, and is not too nervous about the job awaiting him. "Usually Friday nights I do 13s, 14s, 15s and 16s, and then touch judge for the seniors on Saturdays," he said. "Going from local footy to the representative footy is a bit faster. "They expect us to be perfect, we can't make a mistake." Jaiden though, is taking a positive attitude into the weekend at Emerald, and believes his role in the sport is great, urging more people to learn the role he enjoys so much. "We need more referees, particularly men who want to do it and kids to take pressure off, we are struggling for numbers," he said. This weekend of representative whistle blowing could lead to weekends at the top level for Jaiden Ward, and he is taking it all in his stride.